After my most recent visit to Henry Coe, thinking I'd climbed just about everything the park had to offer, I discovered another named summit on the official park map that had eluded detection. Bear Mountain Peak appears as a rounded bump only a mile south of Bear Mountain (an official, USGS/BGN named summit), the former only a foot shorter than the latter. I had been to Bear Mountain more than 20yrs ago when I used to ride my mountain bike extensively throughout the park before I got into peakbagging. I figured I could reach both of these in another 20mi day much like my two previous visits this year. In addition, there is an unnamed peak just outside the park that I figured I could tag as well without adding more than a couple miles. The last summit, Jackass Peak, is really just an easy bonus on my way to the others - seemed a shame not to walk the couple hundred feet off the road to pay it a (third) visit. I got started on the Corral Trail out of park HQ around 8a. I would see no one for the next seven and half hours. The outing went like clockwork, without any significant obstacles save for the 23mi distance and almost 6,000ft of gain. The first hour was spent in reaching Jackass Peak following the Corral Trail, down the Poverty Flat Rd to the campsite of the same name located on the Middle Fork of Coyote Creek, and then the climb up to the saddle above which Jackass is located. The small hilltop was a lovely green. I took a few photos and descended back to the road. A bit more uphill followed, then a long descent down to the East Fork of Coyote Creek via the Shafer Corral Trail. Once at the creek, the Narrows Trail follows along the west side for about a mile before ending at a major road junction where the Blue Ridge, Bear Mountain and Rock House Ridge Roads all come together. Continuing north to another junction, I then followed the Little Long Canyon Road north to a gate atop a low ridge. Though locked, someone had cut a convenient hole through it to allow easy passage. I then dropped down to Water Gulch at a lovely meadow area and the park boundary. There is no fence here to note the boundary - I think the landowner simply hoped the gate back on the low ridge would serve the purpose. The land here is used to graze cattle and there was plenty of evidence of their presence though I saw none in passing through. Several ranch roads run steeply up the west slopes of Peak 2,020ft immediately adjacent to the meadow. I picked the righthand one and followed it to the summit ridgeline and then onto the summit. A few boulders marked the highpoint with views in all directions taking in the springtime scenery of the range. My descent off the east side of the summit was not as nice as I had planned. I'd spotted an old fire break heading off that side from the satellite view but had some trouble locating it. Where I thought it should be I found only thick brush. I ended taking a slightly different course down that had some mild brush but nothing of consequence. Mindful of the ticks I picked up the previous visit, I did a quick check for the pests on my clothing when I reached the bottom at the East Fork of Coyote Creek. From the creek a steep road leads up the west side of Bear Mountain, eventually rejoining Bear Mountain Road at the park boundary. Back inside the park, it's a straightforward hike up to the highpoint at Bear Mountain. The peak is of interest hydrologically, acting as the triple divide for the three main drainages in this part of the range. North and east drain to Orestimba Creek and to the Central Valley. To the west is the drainage of Coyote Creek which flows into the SF Bay through San Jose. A narrow slice to the south drains into Pacheco Creek, the Pajaro River and then to Monterey Bay. The views take in much of the northern extent of the Diablo Range as well as the snowy Sierra far to the east. A small earthquake monitoring station is set up directly over the benchmark at the summit. A note on a piece of paper politely as visitors not to disturb the equipment. To the south is the barely lower Bear Mountain Peak, and it was to this last summit that I next turned my attention. I returned along Bear Mountain Rd, passing a trail junction for Bear Spring, to a non-obvious connecting ridgeline near a gate I had passed through earlier. An old fire break along this ridge makes passage far more reasonable than it would have been otherwise and I made swift progress for the 3/4mi distance to Bear Mountain Peak. The park map shows this as the Bear Mountain Peak Trail but it is nothing more than the map-maker's fantasy, much like the Robinson Mountain Trail I had discovered to not exist the previous year. The last several hundred feet go steeply up the grassy north side with a large spread of shooting stars in bloom. The summit itself is a clump of conglomerated rocks under the shade of an oak tree growing there. 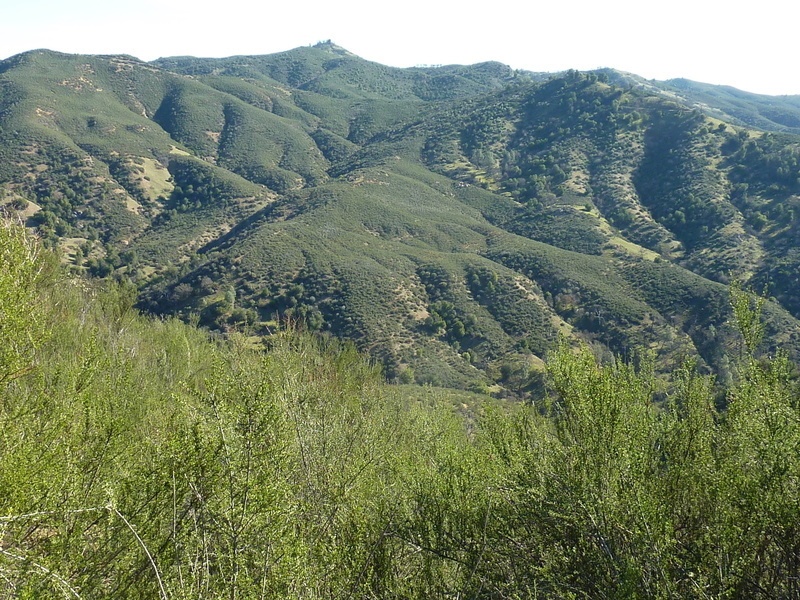 The summit provides a good view to the southwest of the Coyote Creek watershed inside the park. What a cool hike, Bob! I dayhiked Bear Mtn about 33 years ago- very shortly after the Coit(?) acquisition nearly doubled the size of the original park boundaries. A very hot day (low 100's). From Bear, I hiked south to Mississippi Lake for a swim that never happened (too much algae scum around the shoreline) so I soaked my shirt for the return to headquarters via the summit of Peak 2080+, which was (and is) inside a private in-holding. I'll never forget how sobering it was to see Blue Ridge so far to the west- and to realize how far beyond that my car was. Ugh. Just curious what shoes do you wear Bob on your long hikes? Nothing special - $40 boots I buy from Big 5 about 3-4 times each year.